What I Earned From Blogging In 2017 - And How! Halfway through 2017, I started to publish monthly blog income reports after seeing some other bloggers doing the same and finding them really interesting to read myself. 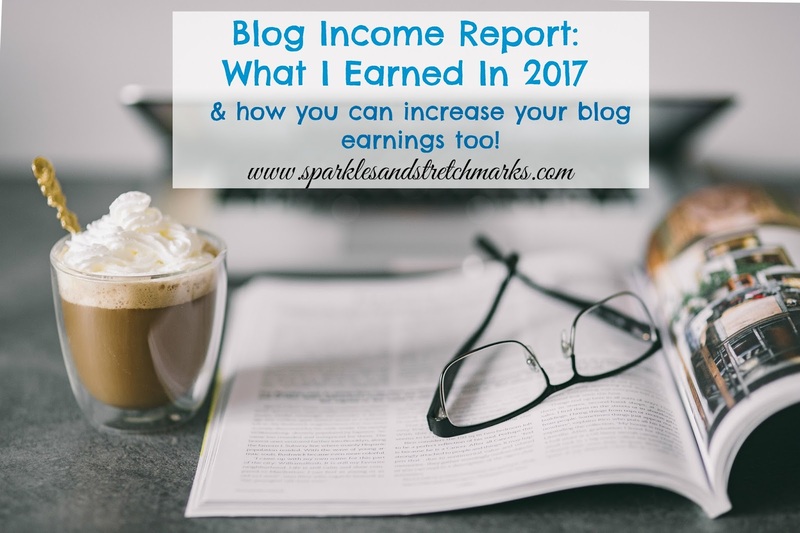 It turns out that a lot of you find them interesting too as they became some of my highest read posts of the year and so I thought I'd publish an income report for 2017 as a whole. But as always, I don't feel comfortable sharing the stats alone as I worry it will come off as braggy which is not my intention - instead I prefer to share the results along with some tips and some information about HOW I've managed to earn what I have. I am passionate about being honest and transparent in my work, and in helping others to achieve their goals too - I truly believe that if I can turn this blog into a profitable business on my own, then almost anyone else can too. And If I can help people to realise and reach their potential, I want to do that! I started my blog purely as a hobby during the last months of my first pregnancy in early 2013. For the first half of the year, I didn't earn anything at all from it - infact I didn't know that making money from blogging was a thing...from around month 6 onwards though I started to make a bit of pocket money from it, and for the whole of 2013 I made around £1,000 from the blog. In 2014, after realising that people did indeed make good money from blogging, I decided to start taking it more seriously with the intention of being able to avoid returning to full time work, and instead stay home with my baby son. I managed to earn around £7,000 that year....the equivalent of a part time wage to me at the time, which was enough to justify me working from home and not returning to my pre-pregnancy role. In 2015 I was absolutely delighted when I managed to earn around £14,000 from blogging - this was the equivalent of what I had previously been paid in my full time minimum wage office job, and I was so glad I'd made the decision to work from home! In 2016, I was astounded to have earned just over £18,000 from my blog - I had never dreamed I'd be able to earn such an amount from home and in all honesty I never expected to be able to top it in 2017, in fact I didn't expect to even be able to reach the same target. Well I'm pleased to report than despite my doubts and fears, 2017 ended up being my most successful year as a blogger to date! Over the course of the year, I earned £32,230. Now I'm aware that this figure will indeed be small change to many bloggers with much bigger followings than mine, I am by no means the blogging worlds big success story and I don't pretend to be...I am very much a "middle of the road" blogger...my follower numbers are moderate at best, and my fees are somewhere toward the middle of the scale. However from a personal point of view, based on the minimum wage office work I have done previously - £32k is a HUGE amount of money, and far more than I ever expected to be able to earn even in an employed role - so to earn this amount from home, with the freedom to choose my own working hours and holidays, with no boss as such to answer to, and from doing something I love as part of a business I have single handedly built from nothing - feels pretty amazing! Of course, some months are better than others - I've had months where I've earnt very little and months were I've done exceptionally well. For example in July I earned over £7000 in one month, but in September after a month of illness left me unable to work much - I earned just £1500. It's easy to look at one months income report and think everything is always rosey but it's honestly a very up & down sort of income that can be difficult to rely on, so it's important to budget well (something I really need to work on!). But What Is The Down Side? As great as this all is, I feel a responsibility to be honest about the fact that there most certainly IS a downside to blogging as a full time job. In fact there are a few of them in my experience and opinion. It's easy to look at a post like this, see the sum of money earned and think that this is the answer to all of your prayers....but nothing is ever that simple. *High Pressure, High Demand - When you work for yourself, the pressure is all on YOU. There is nobody to delegate tasks to when you feel overwhelmed, there's nobody else to blame when things go wrong. You are doing the job of 5 or 6 different people - you're doing admin, you're doing fee and contract negotiation, you're doing a writers job, a photographers job, running 4 or 5 different social platforms at once, being your own marketer, finding your own work, running your own accounts and you feel as though you have to take most jobs offered to you incase its months until the next one comes in. It can be VERY stressful. *Working around family life is difficult - Over the years I have learned that there's a reason they say never to work with children or animals, and as a parenting blogger you are expected to include your children in your work often. This is not often easy. It can also be difficult to fit the amount of work required each day into a family schedule, particularly if you don't have a lot of outside support. I find that a lot of PR people are young and childfree, and therefore don't understand why a mother of 3 may struggle with a 1 day turnaround on a post. It can also be a bit of a moral dilemma...I don't always feel comfortable having my children help me to advertise a product. *It is all consuming - in many ways, blogging and all that goes along with it can take over your life and bring you down. I've written about this recently here - blogging can and has made me quite unhappy at times and no amount of money is worth that, which is why in 2018 I'm going to be readdressing the balance and why I no longer want my blog earnings to be our families sole income..the pressure on me has been too much. This won't be the case for everyone, but it is something I struggle with personally. Good money in a job doesn't always equate to good mental health! *Lack of stability - You can just never guarantee how work is going to go from one month or year to the next. Even now, looking back at my earnings for the last 5 years...I'm terrified! My earnings have grown each year, but what if this is the year they dip dramatically? Any day now, brands could decide they no longer value influencers and stop paying us well or often. This work is fickle and unreliable in many ways...it's a scary income to rely on at times. And then there's all the invoice chasing and the fact that many companies can take months on end to pay bloggers what they're owed. I'm still owed money for work I did for one company back in June! It's not always an easy thing to manage financially. If you've read all of that and you're still raring to go...well good for you! If you're a total beginner....start a blog! It's that simple. Use Wordpress or Blogger.com - pick a blog name - and just start writing! You'll figure out the rest as you go....read as much about the subject as you can, I have some beginners guides here. Join facebook groups on the subject, get to know others in the blogging community....but above all else, START A BLOG. Start writing. And see where it leads you. If you've been bobbing along with your blog for a while, unsure of how to take the next step - find your tribe. I know that sounds like a cliche, but in all honesty the thing that has helped me to increase my earnings more than anything else has been working with others to build each other up. I have a small group of friends in the blogging community who have the same mindset as me...that rather than being out for ourselves and what we can get as individuals, we're a team...and if one of gets a step higher on the ladder of success, she can pull the rest of us up too....the higher each of us climbs, the better we all do together. I know it sounds cheesy, but it works! We do this in ways that some may consider controversial but trust me, this has worked well for us for over 3 years now. So what do we do? Well. We share our work contacts with each other. If one of us gets a job in, we let the rest of the group know about it so that they can send a casual introductory email to that brand too. Its rare that a brand is looking out for only one influencer to work with, and chances are...a quick introduction or reminder email about who you are will be enough to land you that job too. And even if it doesn't, it often means they come to you next time. Working together also means we can all quote the same sorts of fees...meaning nobody gets ripped off on payments. I honestly can't recommend working with other bloggers in this way highly enough, it has made the biggest difference to my income. And if you want to tribe up, feel free to message me - I'm always happy to start buddying up with new people! And you're an established blogger, well then I guess you don't need my advice...if you're already working with other bloggers then keep the faith. Keep trying to up your DA (linkies and as many backlinks from other high DA sites as you can get! ), keep trying to write good content and draw in good engagement from your readers, and keep being pro-active by emailing brands too. And if you have any tips of your own, please feel free to share them below and help someone else out. Don't work for less than you're worth - brands know how to try it on, and if you work in return for cheap product samples...they know they don't need to pay fairly for your work. But they should. The PR person is being paid, why should you advertise their product for free? Hold out for fair payment, don't work for nothing or for not enough. Don't let THEM tell YOU what your time is worth - this is something I've seen happening to bloggers a lot lately. Bloggers I know have been told that they're asking too high a fee for their DA/follower number or certain companies have lowered the rates they pay by saying that the amount is based on blog traffic. At the end of the day, it is YOUR decision what your time and exposure to your audience is worth. This is your platform...your business. THEY do not get to tell YOU what you are worth....if they don't want to pay what you feel you are worth, they don't have to....they can walk away and you can hold out for someone who WILL pay it. I know this might be scary at first, but I have done this myself...In 2018 I stopped taking 20+ low paid jobs per month and instead doubled my fees, turned down the usual low paid work I was offered and held out for higher payers...now I may only take 2 or 3 jobs per month, but I'm earning the same amount of money as before for far less work. Don't expect to earn big bucks right away - this is a slow burn sort of thing. It's taken me 5 years of HARD hard work to earn this amount, it didn't happen overnight and it certainly didn't happen without a LOT of effort on my part. I work on this blog almost 7 days a week, I don't take maternity leave, I pretty much eat, sleep and breath it...it has not been an easy cash cow. Not in the slightest. Don't stab others in the back - I see too many bloggers determined to try and tear other people down to somehow climb higher. It just doesn't work. No man is an island and no blogger is either...we're stronger together. Find your people, work with them to grow stronger together. I cannot stress this enough. I hope you manage to reach your goals in 2018, as always if you have any questions about earning money from your blog - don't hesitate to ask and I'll do my best to help. And for those wanting to start working with brands more in 2018, I have a series of 3 posts going live over the next 3 weeks to help with creating a good media pack and pitch email, setting your fees and creating a rate card, and a Q & A with a PR person on what brands are really looking for in a blogger. Those posts will be going live starting from next Thursday, so be sure to check back then or sign up my blog newsletter here so you don't miss them. Best of luck with your blog in 2018, You can do it! That's amazing. I don't get paid for reviews or competitions - after 6 years! I ask, but noone says yes, so I don't do the work unless I really want to. I find I struggle to get the fees I ask for too, even though I know they're fair for my blog. Do you accept dofollow links? I find this is the sticking point - I turned down 90% of the work that is offered because they won't budge on this, plus usually it's poorly paid. But I'm even getting prs saying it has to be nofollow as well. Based on not doing dofollow, I'm not even breaking even on my blog but I'm not willing to budge on that. Well done, I love to hear of bloggers than have made it work financially. I find at this time of year I start questioning myself on whether to go for it but with my family and health it would just put too much stress on me, so I'm registered as part time and have to limit my earnings to £6,000 a year and it suits me just fine. Well done Hayley you are n awesome blogger!I've just taken leap to self hosted. This is fabulous and so inspiring - well done! I love the idea of finding a tribe, that is definitely what I need to do. Unfortunately I don't think there are many people happy to work in this way, which I guess I can understand... It's a shame though as I can see how it works well. I've just joined a Facebook group for this purpose but as soon as it grows beyond a point I think it loses its intended benefit. Thank you for this great and honst post! This has been a really fab read. I am a relatively new twin parenting blogger having gone self hosted in October last year. Would love to start making a small income from it this year and think the idea of linking with a small group of bloggers is fabulous. You may be getting a message from me! Thank you for giving me the drive to set some real goals! I can’t agree more about having your tribe and working together. I love the we can pull each up attitude and like you this is my biggest way of getting campaigns. Amazing - well done! The income you have managed to achieve is great and you can be very proud of your hard work. It is tough to make blogging into a well-paid endeavour, takes a lot of effort and work. Wow! That's amazing. Thank you for your honesty. I blog for my therapy, in the hope someone reads it. I never imagined the professional bloggers could do so well. Sounds like loads of discipline is needed and commitment. Well done you! I can't believe how much blogging has changed. I started blogging in 2009 in beauty, got noticed and ended up creating a parent blog and worked closely with some brands but back then it was products for reviews. My full time job got in the way and lost time for blogging. I miss it as really enjoyed writing. Would love to know more on how to make some pocket money. My old blogs are beauty alchemy, and two kids and three angels. Brilliant Hayley, well done! Really appreciate your honesty in writing this. Wow! Great job Hayley - you really deserve this because I know you work so hard, and I have always appreciated the time and help you have given me. I got really stressed before Christmas because I had lots of low-paid jobs that all required time but weren't really worth it. My goal for 2018 is to keep working hard but only accept work that is worth my time. But I worry that that work will be so few and far between that I will regret turning things down. But your post has encouraged me to keep trying with this strategy for a bit...! Well done Hayley! So deserved and I'll read your series with interest. Well done Hayley. This is so well deserved. It shows how hard you work. This is super inspiring and gives me lots of motivation!! I’ve just started a blog and would like for it progress into something I can monetise but as it’s all so new, I feel like I have a huge mountain to climb and it’s fairly intimidating. Reading your story really encourages me. Thank you!! Thats amazing, congratulations! I am a casual blogger looking to take it more seriously so this has been a big inspiration for me. Would love to be part of a tribe as well, that sounds awesome. Thanks for posting! Thank you so much for sharing such in-depth information with us. It is priceless. I shall pass this information onto my daughter. Thank you again and many congratulations on your success, both in your homelife and your blog.